An all time Classic. and totally deservedly so. Such a simple language and such a powerful story relevant even 70 years post it has been published. This says a lot about the book and the author and the times we are living in. Some things, like inherent human behaviour, just does not change. 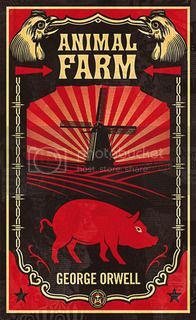 The story in itself seems like a short fairy tale (the initial book run had this in the book tagline) of an animal farm where the animals revolt against their owner. At the outset it sounds like a children’s book (and apparently it was rejected in the US with many publishers claiming that there would not be any market for children’s book). But a children’s book, it is not. The story, in brief, is about a animal farm and the revolution led by some animals to overthrow the owner and take control themselves. Beginning with the Animalism commandment that “All Animals are equal”, the pigs gradually promote themselves to a higher authority citing different reasons. The leader Napoleon convinces all the animals on the subsequent luxuries and unfairness doled out to them. All the time making all animals feel that they are a part of a bigger purpose and thus should be working hard to achieve it. The windmill plays a central role in the whole story, where the entire efforts and the politics goes behind the building of the mill, which is expected to bring in good fortunes for the farm. With lies and connive, eventually the commandment turns to “All Animals are equal. Some Animals are more equal than others”. In the end, there does not seem to be much difference between the earlier human owner and the present tyrants who run the farm. The story in its simplicity explains quite a thing about human behaviour and the tenets of socialism. Reading through the book felt like it was written for the present day North Korea. There is a tyrant ruler who makes everyone believe that it is all for their own good, and has gradually taken the whole country to ruins with rampant poverty and famines. In all, the King and his aides still lead an extravagant life untouched by the poverty around. One can very well imagine how this would have all started. The beginning of most communist states starts with the repeated propaganda of “Capitalism is evil”, “We need to take power in our own hands” and the eventual violent takeover of the state. With the power now in the hands of a corrupt few, the whole region goes towards darkness. Stalin’s Russia, Pol Pot’s Cambodia, Mao’s China or the present day north Korea, all of them relate to such a beginning. The book and the story remains as relevant today as it was a century back. And it serves as a grim reminder of the fallacies of inherent nature. Power corrupts. Am now curious to read the other classic by George Orwell – 1984. Recently read somewhere about this book – “It is a warning, and not a firkin’ guidebook”. Looking forward.